People are generally frightened of what they do not know or understand at the best of times but when it is presented to them in a ‘frightening’ way also, then they just back away and the aggression they are encountered with gives them the perfect ‘ excuse’ to do so. So Oakes agrees that promoting veganism as a moral baseline is preventing people from going vegan and that explaining veganism as a moral baseline in a creative, nonviolent way is “aggression” and “frightening”? 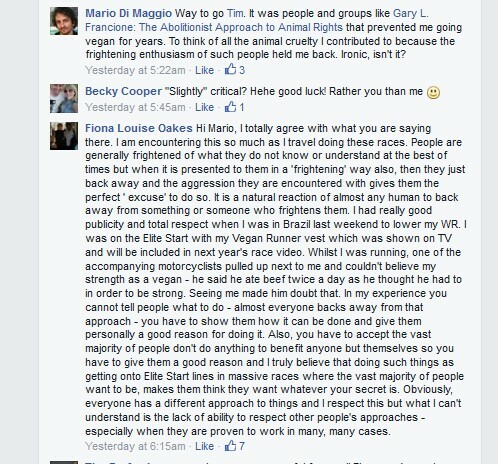 In my judgment, people like Fiona Oakes and Tim Barford are doing tremendous damage by reinforcing the idea that there are two options: (1) being a “fundamentalist nutter” who acts like a “radical extremist who just appears to be dictating to everyone what they should and should not do” or (2) stating that veganism is not “for everyone” and “not probably for very many people” because “many people…get very ill” on a vegan diet. There is a third option: creative, nonviolent vegan advocacy. But that does not fit with the new program of moral relativism and “flexible” veganism of The Vegan Society, for which Oakes and Barford are acting as cheerleaders. Many people do care morally about animals. It is time that we stop treating them like idiots and engage in discussion with them about why their own moral concern should lead them to stop participating in the exploitation of animals and to go vegan. [W]e don’t want to continue the debate as it is essentially detrimental to the animals and the vegan cause. So saying that veganism is not “for everyone” and “not probably for very many people,” and referring to those who promote veganism as a moral imperative as “fundamentalist nutters” is not detrimental to the animals and the vegan cause, but discussing it is.